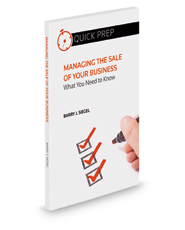 This Aspatore legal title offers executives and business owners a crash course in what to expect from and how to best prepare for the sale of a business. The text is equally applicable to individuals who consider buying a business or to business owners looking to expand by acquiring other companies. This easy-to-read guide will take you step-by-step through the sale process.